Canyoning on the French Riviera, Cote d'Azur an unforgetabble experience. Near Nice, an activity accessible to everybody! Alpes French South are the best canyoning place in the world, in less than 1 hour from Nice by car. Near Nice, Cannes, Monaco, Menton, Grasse ,Vence, discover, in individual, group or family, the most beautiful canyons of the Alpes Maritimes, Provence Alpes Côte d'Azur and Liguria. Offer unforgettable moment with our nature and canyoneering trips in crystal water with professional guide more than 20 years of expérience. Price from € 45, panel price> 8 and families. Childrens since 8 years old. 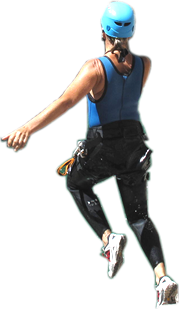 Ultimate adventure on South of France, French Alps, French riviera cote d’azur, canyoneering is go down a river, with hiking, water sliding, jumping, rappelling, in green water. If you are looking, for fantastic adventure in a spectacular nature, then you have to come in complete safety in canyoning. The prices includes all the gear: wetsuite, harness and helmet. liability insurance. Sports shoes, swimming sweat, towels, water. Possibility to rent shoes professional canyon for ten euros (10 €). Contact us in advance for sizes and availability. We accept payments by cash or check. We don't provide payment by credit card. Despite a little warm (end of May), I spent a beautiful sunny morning in the company of Hubert made me discover the canyoning. For some time, I wished to test this sport that combines climbing, hiking; and I must admit I loved it !! Thank you again for this discovery and hope to repeat the experience. Merci encore pour cette découverte en espérant pouvoir renouveler l'expérience. As if we were on vacation time for a morning Breil sur Roya Hubert to discover canyonig !!! Thank you for letting us share this sensational activity! A repeat again and again! A refaire encore et encore! Fantastische Canyoning met mijn 2 jongens (11 en 13). Zeer professioneel en goed Engels sprekend. Zeer mooie Canyon (l'imberquet) met hoge sprongen, glijbanen en rappels. Volgende keer zeker weer met Hubert! Bedankt! Fantastic canyoning with Hubert, Very well organized, save and good equipment. I can highly recommend Azur Canyoning!! Hubert, merci! The prices mentioned on this site include coaching by state qualified guides, provision of equipment and liability insurance. 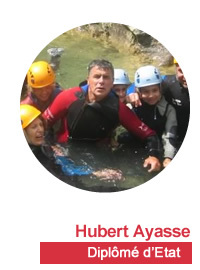 Hubert Ayasse is a professional activity, mountaineer, traveler and lover of adventure and travels the world in search of new and unexpected. Member of the SNAM (National Union of Mountain Guides) and its canyon commission. The supervision of the activities is assured by professionals (approval youth and sports n ° 00697 EDO153) having more than 15 years of experience.